A weekend of multiple churches from the same community coming together to love the youth of their city is a special occasion. Disciple Now (DNOW) is a youth ministry event that has been impacting the lives of Oklahoma Baptist youth for many years. Since the beginning of the year, churches across Oklahoma have been teaming up to put on an event that will challenge students to boldly proclaim Christ, all the while knowing they are supported and loved by others in their youth group and city. really big win for them and for us,” said Mark Cruz, student pastor at the downtown Tulsa campus of Broken Arrow, The Church at Battle Creek (TheChurch.at). 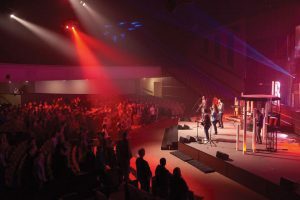 Churches in the Oklahoma City and Tulsa metros took different approaches toward their individual DNOW weekends. TheChurch.at hosted “LIFT” tour, which is a program from Student Leadership University that tours the country. Broken Arrow, First attended the same LIFT weekend. Churches in Moore and South Oklahoma City also cooperated organizing “United Weekend,” hosted by Oklahoma City, Eagle Heights. Jerry Young, youth pastor at Moore, First, described working with other churches in the same city for a common goal. 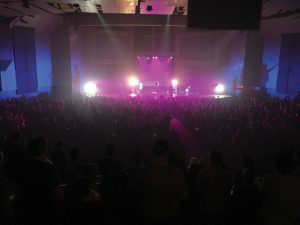 Bethany, Council Road held an alternate version of DNOW called Big Weekend. The Cody Dunbar Band led music, and Andrew Burkhart brought the message. Nearly 200 teens gathered from across the Oklahoma City area to praise in worship, learn about the Gospel, play games and more. Oklahoma City, Quail Springs; Edmond, Henderson Hills and Edmond, First partnered for a northwest Oklahoma City-focused group, also with LIFT tour. decision to partner together for DNOW weekends so that students from the same schools and places could be brought together for a weekend and worship together and see how the Lord moves through that. “It builds a great community among the body of believers in northwest Oklahoma City and Edmond and helps the kids to know that they are not alone in their faith. Seeing it all come together is incredible,” DeGiacomo remarked. Throughout DNOW weekends, youth groups divide boys and girls into groups by grade. Traditionally, people within the church open their homes in which the groups stay for the weekend. “Seeing all the host parents and all the ways they interacted with the students and how they provided food and snacks and homes to our students, it was awesome to see the kids make themselves at home and those relationships build,” Hummingbird said. Relationships with each other and volunteers, or adult sponsors, and building confidence in sharing the Gospel are focal points of the time at DNOW. Through relationships built and strengthened at DNOW, youth pastors saw tremendous growth within their respective groups. “We’ve seen a lot of students come together… we had kids really bond where normally kids wouldn’t hang out with each other. It really helped them to see each other as brothers and sisters in Christ,” explained Cruz. Most explained the weekend as a refreshing time for students to clear their heads from the business of school and focus on the ultimate goal as Christians, proclaiming the Gospel. Oklahoma City, Quail Springs spent Saturday afternoon doing service projects, mostly involving spending time with senior adults at retirement communities. “Watching them just love on and encourage and open up their bible and share scripture with these senior adults it was truly a remarkable thing,” said DeGiacomo. More than students benefitted from DNOW weekends across the state. 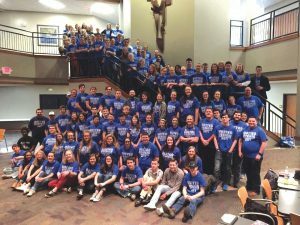 At Oklahoma City, Quail Springs, college-age students through senior adults volunteered their time to invest in the lives of the youth in their church. “We had a college student volunteer to serve as a group leader that lost his father years ago and was able to connect with a student who recently lost their father. So the Lord moved in ways that we couldn’t have imagined, it was such a great match-up,” said Hummingbird, as Broken Arrow, First also featured college-age volunteers. several were baptized from the Broken Arrow, First group. “I think it was a good refresher, they’re going to go and talk about this during school, at lunch, at sports, and they’ll be able to share that with their friends. Our hope is that they will get conversations going about what they learned and how they can share the Gospel with other students at their school,” exclaimed Hummingbird. Through the time spent planning DNOW weekend, countless hours of sleep lost and the Gospel being proclaimed to the impressionable minds of Oklahoma youth, growth and courage were built in youth groups across the state. Look for future coverage in the Messenger, highlighting DNOW weekends in other churches across Oklahoma.